Indigo Furniture opens the doors to their refurbished showroom in Matlock, Derbyshire. 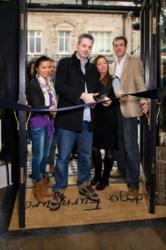 Competition winner, Stuart Allen opens the new showroom. Customers of Matlock based Indigo Furniture were treated to a glittering reopening of their Dale Road showroom. After an intensive refurbishment undertaken in just 12 days the eccentrically British themed showroom, showcasing their beautiful furniture was unveiled to the public. Unique items sourced by Indigo’s creative team include a reconditioned telephone box now repurposed with a touch screen and a reclaimed oak floor, painstakingly restored at Indigo’s Derbyshire workshop and installed by Indigo’s own carpenters. Crowds began to gather from 10am on Saturday 13th October to view the initial unveiling of the shop windows – autumnally themed and including an old station setting, a nod to Matlock’s Peak Rail heritage. At 11 am competition winner Stuart Allen was in place to cut the ribbon, after winning a nationwide competition run through Indigo’s Facebook page. As the first customer to step into the new showroom, he also won a £500 voucher to spend that day on Indigo's extensive range of furniture. Indigo Furniture's showroom is open 7 days a week Mon to Sat 9:00am to 5:30pm and Sun 11:00am to 5:00pm and their full collection can be found online at http://www.indigofurniture.co.uk.